Circumstantial evidence suggests that in the first decade of the twentieth century Ives composed three Rudyard Kipling songs, one of which was Tolerance, a setting from about 1906 of lines from Kipling’s poem The Fires. But Kipling was notoriously difficult about copyright. 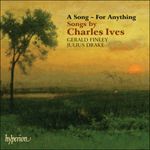 Ives had first heard the lines quoted in a lecture by President Hadley at Yale, and he incorporated the song into an ensemble piece called A Lecture by President Arthur Twining Hadley. When he came to publish Tolerance in 114 Songs the words were described as a quotation in Hadley’s lecture, without identifying the author. Selon des preuves circonstanciées, Ives aurait, dans la première décennie du XXe siècle, composé trois mélodies d’après Kipling, dont Tolerance (vers 1906), sur des vers tirés du poème The Fires. Or, tout le monde sait combien Kipling cédait peu volontiers ses droits. Ives, qui avait entendu ces vers pour la première fois lors d’une conférence du président Hadley, à Yale, incorpora cette mélodie dans une pièce d’ensemble intitulée A Lecture by President Arthur Twining Hadley. Puis, quand vint le moment d’intégrer Tolerance aux 114 Songs, il indiqua que ces paroles provenaient d’une citation faite par Hadley dans une de ses conférences, sans en identifier l’auteur. Es gibt Indizien, die die Vermutung nahe legen, dass Ives im ersten Jahrzehnt des 20. Jahrhunderts drei Lieder auf Texte von Rudyard Kipling schrieb. Eines davon war Tolerance [„Toleranz“], eine Komposition von ca. 1906 auf Zeilen aus Kiplings Gedicht The Fires [„Die Feuer“]. Nun bereitete Kipling in Sachen Urheberrecht bekanntermaßen große Schwierigkeiten. Ives hatte die Zeilen zum ersten Mal in einer Vorlesung des Präsidenten Hadley an der Yale University gehört. Ives arbeitete das Lied später in ein Ensemblestück namens A Lecture by President Arthur Twining Hadley [„Eine Vorlesung des Präsidenten Arthur Twining Hadley“] um. Als Ives das ursprüngliche Lied Tolerance in den 114 Songs veröffentlichte, lieferte er als Zitatangabe nur Hadleys Vorlesung, ohne den eigentlichen Autoren zu nennen. Or any man’s hearth stone?